Hoka One One’s offerings throughout 2018 seemed to increase at an almost-exponential rate. While they continue to update classics such as the Speedgoat and Challenger ATR models, other models like the Napali ATR appear to be a derivative of the latter. Earlier this year, I reviewed the EVO Mafate, a shoe that I was very excited to put through its paces. 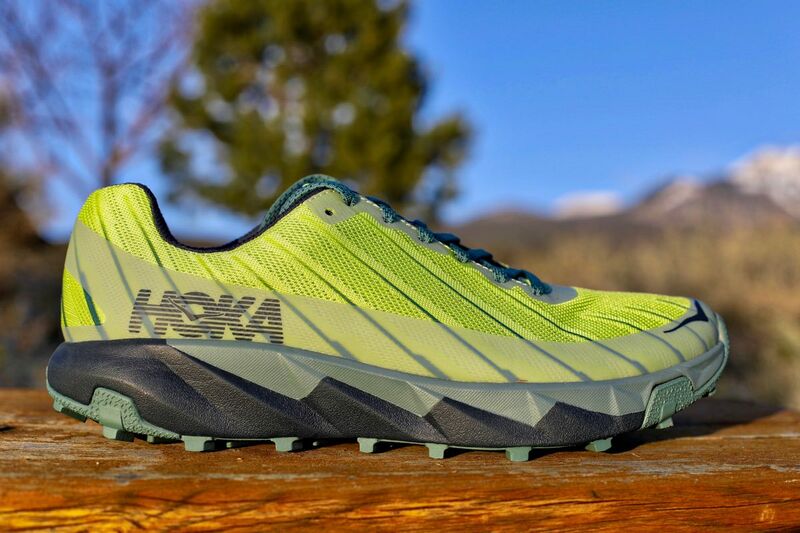 It impressed me and I certainly thought it was one of Hoka’s strongest offerings and one of the best new trail shoes of the year. 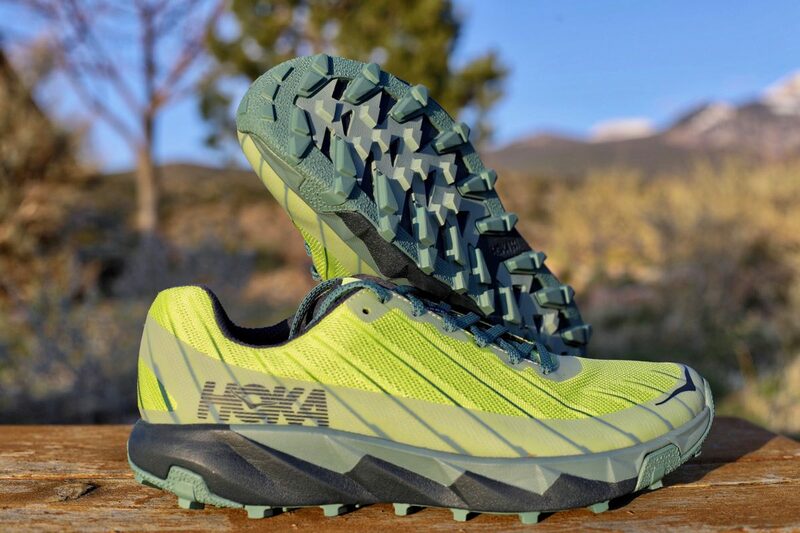 At about the same time, I started testing the Hoka One One Torrent ($120), which at first I considered a lesser model not truly worthy of ultramarathon distances and likely a Tracer racing flat with a trail outsole. After I finished testing the EVO Mafate, I started wearing the Torrent almost exclusively. I came away from each run more and more impressed. The Torrent is a surprisingly un-Hoka-like experience with a more accommodating fit for runners needing a wider toebox, firmer cushioning, and one of the best outsoles I’ve run in. There is no doubt that Hoka running shoes are getting better looking, and while appearances are the last thing I care about in a running shoe, the Torrent looks sharp. Open mesh dominates the upper, allowing this shoe to stay cool and drain incredibly well. My favorite aspect of the Torrent upper is a rubber rand layer that encircles the upper above the midsole. This improves durability by making it impervious to punctures and blowouts from excessive pressure. This simple rand overlay allows the rest of the upper to be open mesh and airy without being fragile. 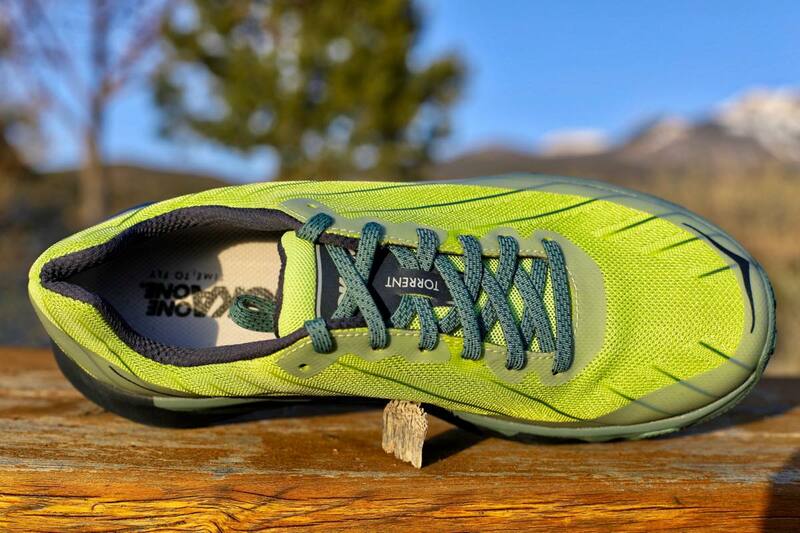 These features together make one of the simplest and most effective uppers I’ve seen in trail-shoe design. Flat laces that stay tied and a stable, gusseted tongue keep this upper locked down on the foot and debris out. The fit throughout the upper is fairly moderate and it should appeal to a lot of different foot types, especially runners wanting to wear models like the Speedgoat 2 and finding the forefoot too tapered. The Torrent has just enough space for some toe splay and it is the widest Hoka model that I have tried. Initially, I worried that the wider midfoot fit would lead to slipping on downhills, but somehow the Torrent stays put on my foot. 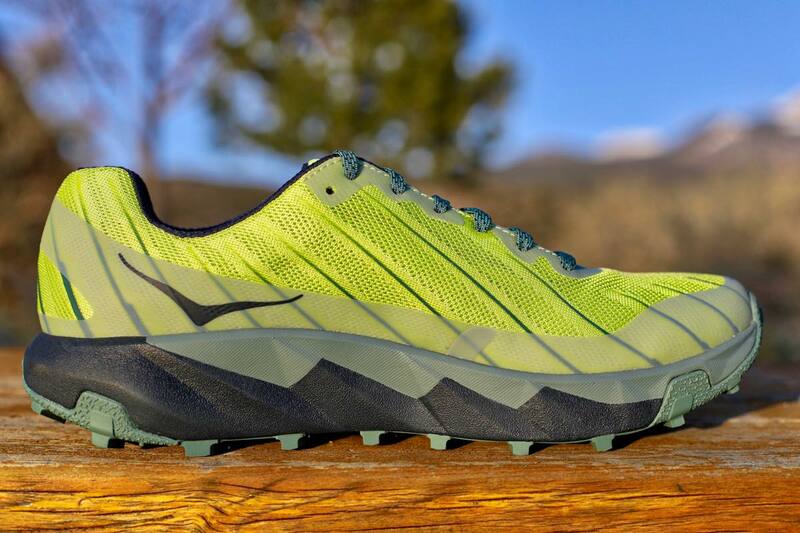 The Hoka One One Torrent lateral upper. The Torrent doesn’t feel or transition like any other Hoka model I’ve tried, and PROFLY midsole cushioning is used, which places firmer EVA foam in the forefoot and softer foam in the heel. This is similar to the technology used in the Tracer racing flat, but not quite as aggressive in durometer. Noticeably absent as well is the Meta-Rocker technology used on many popular Hoka trail shoes. The resulting effect is a ride geared more toward midfoot and forefoot strikers than anything else, and the PROFLY midsole feels geared toward faster running and racing. Despite the lack of a rockplate, the Torrent performed really well on technical, rocky trails, and I never experienced any bone bruising or anything poking through the midsole. Given the relatively tame stack height of 26mm with a 5mm drop, the amount of protection is surprising. Additionally, the forefoot cushioning seemed to improve the more I ran in the Torrent. Initially, I considered this a shorter-distance racing shoe, but after several runs I started using it for everything, including trail speedwork, hills, and long runs. The Hoka One One Torrent medial upper. After testing the EVO Mafate with the Vibram outsole, I didn’t think the Torrent’s relatively simple outsole lug pattern could compete. But, the Torrent’s outsole just continued to impress on everything from loose, decomposed granite to mud and clay. Better yet, after about 120 miles, I’m not seeing any wear on the Torrent outsole. What surprised me most is that the Torrent outsole, with its substantial lugging, runs great on smooth trails as well. Road-to-trail runs felt smooth, and fire roads and dirt/gravel roads felt just as at home in the Torrents as technical trail. In my humble opinion, this currently is my favorite outsole of any shoe from any brand. I was very surprised by the Torrent. Initially, this was a shoe that I considered an unnecessary add-0n in the Hoka line-up, but the Torrent is now my favorite Hoka model. The ultimate proving ground with the Torrent was using it on the 40-mile Grand Traverse Mountain Run from Crested Butte to Aspen, Colorado earlier this summer, and I finished this challenging course with less-beat-up feet than I have in a long time. I felt confident on loose and technical terrain, and when I wanted to increase the pace on the jeep roads, the Torrent didn’t get in the way. For $120, I would hands-down recommend the Torrent over the EVO Mafate, and for runners needing a wider toebox I would recommend the Torrent before the highly popular Speedgoat 2. For a 9-ounce trail shoe, it’s difficult to cram more cushioning and durability into a shoe while maintaining a fun and go-fast ride for racing. If you’re a midfoot/forefoot striker looking for a lightweight and protective trail shoe with exceptional traction, look no further than the Hoka Torrent. Have you taken the Hoka One One Torrent for a spin yet? If so, what do you think of the shoe overall? What details of the Torrent’s upper, midsole, and outsole work the best for you? And where do you think improvements could be made? How do you feel about the features that Tom really likes, the upper’s design as well as the outsole’s performance? The Hoka One One Torrent view from the top. I’ve put around 200 miles into my pair of Torrents, and no real signs of wear yet. These and Challenger ATR4 are the first Hoka’s that fit my feet (wider toe box). The midsole on the Torrent is much harder than the ATR4, and to begin with I didn’t like them as much. They are growing on me, and I now wear them more often than the ATR. One negative I found was the upper stretches gradually for the first hundred miles, so if the fit is borderline when they’re box-fresh, expect them to feel loose after a few weeks. I have ran about 220 miles in my pair of Torrents, including one 36 mile and one 40 mile run. I enjoyed running in Hokas in the pats, but the Torrent fell a bit short for me. The midsole is marketed as the best of both worlds, cushioned yet responsive. However I felt that it was not cushioned enough to be a max cushion shoe for easy miles and not responsive enough to be a nimble fast shoe, just kind of in an underwhelming grey zone. That being said, the shoe has held up extremely well. The outsole shows some signs of wear, but I do a decent amount of road miles to get to the trails, so that is to be expected. The upper is also bombproof, albeit on the hotter side. Maybe this shoe would fit in a sweet spot between the challengers and the speedgoat for some folks, but for me it’s not quite there. It would be nice if Hoka would come out with some ‘wide’ trail shoes! They have some wide versions in a few road shoes, but no wide trail shoes. I go up a half size in the Speedgoat to a 10. I went with my normal size in the Torrent, 9.5, and honestly think I could go down half a size. I also wear a 10 in the Clayton. This does not fit like a typical Hoka. People wanting a wider trail shoe from Hoka, this is it! I absolutely love this shoe. I slightly disagree on the outsole functionality. The tread and depth of the lugs are perfect for just about every type of terrain, but the outsole lacks bite when compared to the Vibram of the Speedgoats or Contagrip of Salomon. I find myself slipping on rocks that I wouldn’t with the Vibram or Contagrip. This is my only complaint with the shoe. Definitely try it on in person to get the right size. I’m just over 100 miles and it’s holding up well. I think the shoe turned great! I also size down 1/2 size (I’m around a size 10) compared to the Speedgoat II and I believe it is a more generous fit with the flexible upper. I also agree that the outsole of the Vibram lugs on the Speedgoat do grip a bit better on wet rock and in snow/slush/ice compared to the Torrent. However, the Torrent lugs do provide very good traction on a wide variety of surfaces (mud, etc.) and I do like how they are a bit lighter than the Speedgoat. I think this is a great shoe from 10km-100-miles on all sorts of trails/mountains…of course it depends on trail conditions and the runner. I recently raced Pikes Peak Marathon, Speedgoat and Ring of Steall (very technical and muddy) in the Torrents and they performed quite well! My Torrents performed in accord with everything in the review and commentary. Great tough shoe. Ran two six milers leading into the Rut 50k in Big Sky, and then used them during the race, which covers highly technical shale with 10,500 vert gain. The Torrents took a total beating and yet somehow came through nearly scratch-free!! Tough shoe! Nice wide fit. Can anyone speak to the sizing vs the Terra Kiger 4? I wear a 12 in the Kiger 4s but it also seems to be a model with which a lot of people size up. I wear a 10 in the Kiger 4s, which felt kinda racing snug, but worked. I wear a 10 in the Torrents as well and they have a bit more room, both in width and length. Agree with Tom. I’m an 11.5 in everything including the Kiger 4’s, did the same in the Torrent and just have a little bit more width and length. So I now have about 75 miles on my Torrents, including a 20-miler summiting San Gorgonio a couple of weeks ago, and think I’ve got a decent sense of how they fit. I had previously worn a 12 in three different pairs of Kiger 4s, and they fit well; I ordered an 11.5 in the Torrent, and it’s quite comfy. I like a liiiiiiittle bit of extra room in front of my big toe because of the way my toes splay when I run, and the 11.5 works perfectly for my feet (for which the Kiger 4 size 12 worked *almost* perfectly). I think the toe box is a little more accommodating than the Kiger 4s, as well, though that could be due to the way the upper does stretch a bit, as others have noted. Frankly, I’m not complaining about that. My *one* gripe is that small chunks of the rubber on a couple of the lugs tore off on that long run. Granted, I live in Joshua Tree and the monzogranite here is pretty damn rough on shoes and boots, but I wasn’t expecting such obvious, visible wear this soon in the life of my shoes. I must’ve scraped something nasty in the dark and just didn’t realize it. Regarding the rubber rand overlay, does this restrict stretching? I like a bit of give in the toebox on the outer side. I have about 140 miles in the Torrent and love the feel of the shoe. Previously I’ve run in the Challenger 3 and had a good experience, but the Torrent is more durable, has a better trail feel and a better fit. My only complaint is the upper seems to stretch and loosen a bit. My laces are almost maxed out at the top to get a good fit, making them a little on the long side. I am trying to buy the best shose for greek mountains that are rough! Probably a wrong design due to it’s rounded form. There is no much protection on the upper in hard rocks or stones! but not for high technical terrains or for not very fast runners in diverse terrains. The shoe is almost great for me. My only complaint is the mid-foot fit. It’s very tricky to tighten the laces just right. If they’re too snug, the tops of my feet hurt. If they’re too loose, the shoe moves a little on my foot and I subconsciously lift my fore-foot up and end up heel-striking and with a pain in my tibialis anterior. Something like a Salomon Sensifit, Nike Flywire or Saucony ISO would go a long way to improve the Torrent.